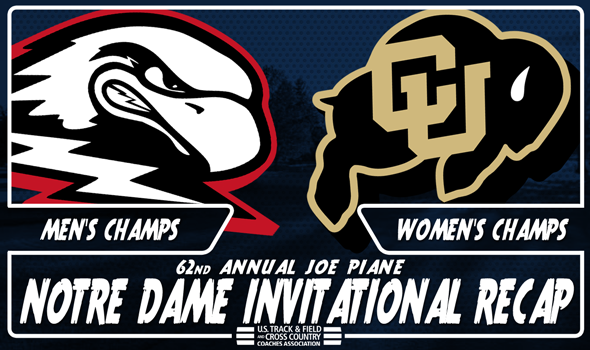 Depth – and the Mountain Region – won the day at the 62nd annual Joe Piane Notre Dame Invitational. Colorado‘s women and Southern Utah‘s men captured the team titles in Notre Dame, Indiana, while New Mexico’s Ednah Kurgat and Alabama’s Gilbert Kigen won individual glory. Teams from the Mountain Region finished 1-2-3 in the men’s standings and 1-2 in the women’s. Look below for more information about an incredible day of racing on the Burke Golf Course. It turned out to be quite the battle up front between No. 1 Colorado and No. 3 New Mexico in the Women’s Blue Division Race. When the dust settled, the Buffs and Lady Lobos both put four runners in the top-10. New Mexico saw Ednah Kurgat (16:01.8) and Alice Wright (16:12.0) go 1-2 with Weini Kelati (16:23.9) and Charlotte Prouse (16:33.0) in sixth and eighth, respectively. Colorado watched Dani Jones (16:12.8) take third with Makena Morley (16:30.0), Kaitlyn Benner (16:35.4) and Sage Hurta (16:35.6) close behind in seventh, ninth and 10th. Through those four runners, the Lady Lobos owned a 17-29 lead over the Buffs. If New Mexico’s fifth runner beat Colorado’s fifth runner by seven or more spots, there would be a lot of discussion as to who the new No. 1 team in the country should be – especially with No. 2 Oregon’s performance at the Dellinger Invitational. Instead, the Buffs put two across the finish line before the Lady Lobos’ next runner completed the 5K tract. Colorado ended up edging New Mexico by a score of 47-51. No. 7 NC State took third place in the team standings with 118 points, while t-No. 9 Arkansas finished fourth with 171 and No. 27 Utah rounded out the top-5 with 190. The only two runners to finish in the top-10 that weren’t Buffs or Lady Lobos were Utah’s Grayson Murphy (fourth, 16:17.9) and California’s Bethan Knights (fifth, 16:18.6). Southern Utah turned Notre Dame, Indiana into Upset City. The 13th-ranked Thunderbirds toppled fourth-ranked Colorado in the Men’s Blue Division Race by a score of 72-99. Southern Utah, led by Mike Tate (fifth, 23:51.8) and Kasey Knevelbaard (sixth, 23:58.5), put its entire scoring lineup across the finish line before the Buffs’ fourth runner completed the five-mile tract. The Thunderbirds went 5-6-17-21-23 with an incredible 21-seconds spread. Colorado saw Joe Klecker take fourth in 23:33.7 behind Alabama’s talented trio of Gilbert Kigen (first, 23:23.7), Vincent Kiprop (23:24.2) and Alfred Chelanga (23:26.9). Eduardo Herrera finished second for the Buffs in 10th place (24:00.3), while John Dressel (20th, 24:11.5), Ryan Forsyth (24th, 24:13.2) and Zach Perrin (43rd, 24:31.3) rounded out their five. Air Force, Michigan and Eastern Kentucky – all teams who received votes in the most recent National Coaches’ Poll – were third, fourth and fifth in the team standings. Depth might be an issue for Alabama. The Crimson Tide went 1-2-3, but finished eighth as a team. Other top-10 runners included New Mexico’s Alexander Palm (seventh, 23:58.8), Eastern Kentucky’s Erick Rotich (eighth, 23:59.2) and Air Force’s Andrew Johnston (ninth, 23:59.9).